The FTM allows for a comparison of tax policies and practices in different countries, using a standardized methodology and unified research approach thanks to jointly developed common research framework. 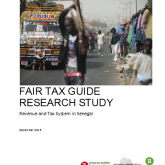 In the Senegal FTM report you can find the detailed research results from Senegal. This report is in French.